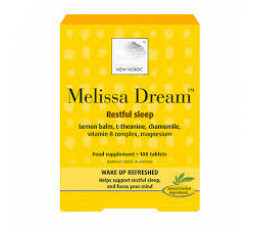 Melissa Dream uses well known, safe ingredients to calm you down during the day, or prepare you for sound, deep sleep. Melissa Dream will make you wake up refreshed and rested, ready to tackle the challenges of the day. For Sleep disorders: Take 2 to 3 tablets before bedtime. After two weeks use, 2 tablets are sufficient. Not suitable for children. Do not exceed stated dose. Do not take if you are pregnant or breast feeding. If you are taking any prescribed medicines consult your MD.